So you've laid eyes on a handful of trends you're ready to finally try out. You've added a few of them to your wardrobe rotation, and now that spring temperatures are warming up, it's time to get going. The only thing that's holding you back? If you're like many of us, it's less about wearing the actual trend and more about deciding what shoes to pair with it. Whether it's a psychedelic tie-dye tee or a prairie dress or even something on the tamer side like a pair of baggy jeans—whatever the item in question might be, it's fair to argue that the footwear you team with a trend is equally as important as the trend itself. With this in mind, we cobbled together an edit of some of 2019's biggest trends so far and conveniently matched a pair of fun shoes to go with each. Ahead, discover 12 easy-to-wear trends and even easier shoes to accessorize them with, starting now. Skip the sneakers and give your '90s-inspired baggy jeans a touch of glamour with season's PVC trend. Whether you're going for a roomy pair of cargo pants or a tailored version, white shoes will add a fresh pop at the bottom of your outfit that can easily tie in with whatever you're wearing up top. If you're test-driving the bike short trend this spring, you may be wondering what on Earth to accessorize them with. As seen above, a pair of low-heel Mary Janes is chic and not over the top. There's no better time to swap out your dark separates for a fresh assortment of Crayola brights (especially green). Team them with beige shoes to let the colors do the talking. The dad shirt is returning this spring, swathed in fun Hawaiian prints. What to wear below? We suggest a cool cargo skirt and lace-up sandals for a tropical-meets-city look. 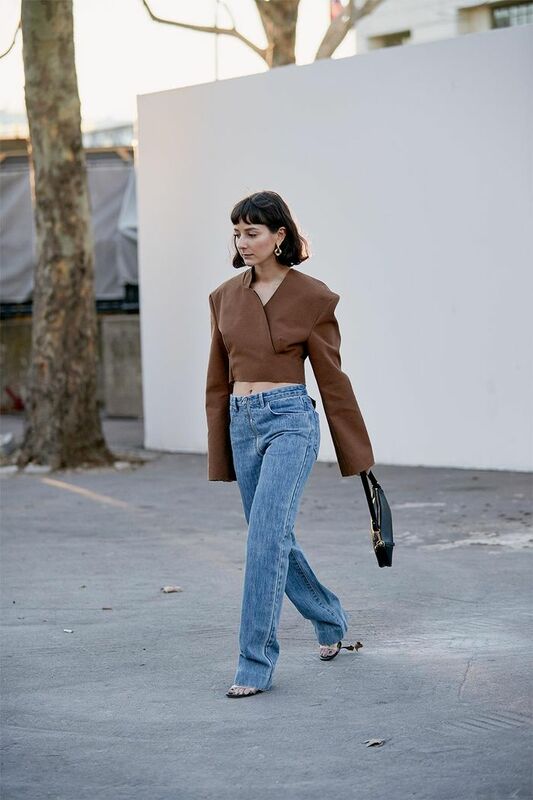 During the most recent fashion month, it seems every editor and influencer alike was tucking their pants into boots. Keep the trend alive with a pair of cool cowboy boots. Add contrast to dainty ruffles with a pair of chunky sneakers that you can walk around all day in. A satin or silk skirt already has a boudoir feel to it. Add to the aesthetic with a pair of Victorian-inspired lace-up boots. Plaids don't have to be reserved for autumn, as evidenced in the bright ensemble above. Add extra texture to the pattern with the season's covetable python-print footwear options. Suiting is decidedly here to stay. Translate the duo to spring by styling it with a pair of cool strappy sandals. Double down on the grunge appeal of spring's tie-dye trend, and finish off the look with utilitarian footwear. If it's too warm for boots, consider low-top Dr. Martens. White denim will always be a solid spring trend to adopt into your wardrobe. For 2019, accent the palette with a cool cow print. Love reading about fashion trends? Here are more must-know trends for 2019.